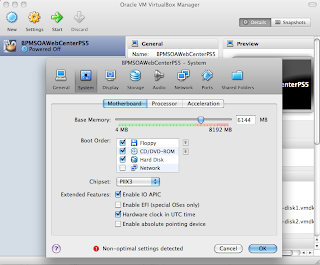 Actually this is not about Virtual Machine for SOA and BPM Suite 11g PS5 - it works great, but rather about how to run Virtual Box on Mac OS X Snow Leopard (10.6.8). Virtual Box grants memory based on host computer settings, this means if host computer is 32-bit - you are not able to grant more than 3.5 GB - this is not enough to run pre-build image. My MacBook Pro is 64-bit machine, it runs Mac OS X Snow Leopard (10.6.8). This OS starts by default in 32-bit mode, even hardware is capable to run in 64-bit mode. If someone runs similar environment, it may confuse you when trying to use Virtual Box - pre-built image will not take more than 3.5 GB memory. But there is a trick, during Mac OS X Snow Leopard (10.6.8) booting, press 6 and 4 keyboard buttons - it will load Mac OS X Snow Leopard (10.6.8) kernel in 64-bit mode, you will be able to grant much more memory. Read more about this on Apple support site. I'm getting the following error when I try to import the appliance to virtualBox in Mac OS. I think I may have used a wrong tool to concat the multipart zip files. Can you please recommend me a tool that you used to concat these set of files at http://www.oracle.com/technetwork/middleware/soasuite/learnmore/vmsoa-172279.html. Failed to import appliance /Users/denis/Downloads/Oracle-SOA-VM/oel5u5-64bit-soabpm-11gr1-ps5-2-0-M.ovf. Start tag expected, '<' not found. 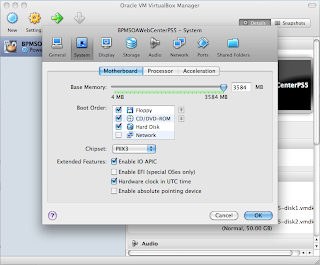 Location: '/Users/denis/Downloads/Oracle-SOA-VM/oel5u5-64bit-soabpm-11gr1-ps5-2-0-M.ovf', line 1 (0), column 1. You need to use 7z on Windows. Then copy extracted files on Mac OS. I was able to fix it by using a 7z extractor. Previously I was using cat command to conca those files.